RAYMONDVILLE — More than two years after it closed, the former tent-city prison is undergoing a makeover. Management and Training Corp., which purchased the 53-acre facility from Willacy County in March, is repairing a 1,000-bed concrete housing unit as it prepares to remove 10 tent-like domes, spokesman Issa Arnita said Wednesday in a statement. Meanwhile, he said, the company continues its search for a customer for whom to hold inmates. Prospective customers include U.S. Immigration and Customs Enforcement, company officials have said. Officials expect the facility to become a detention center holding undocumented immigrants. “Once a contract is in place, we’ll have details to release regarding new construction,” Arnita said. Raymondville Mayor Gilbert Gonzales said MTC plans to build four to six housing units. But Gonzales said he did not have information on the number of inmates the new housing units would hold. In February 2015, a riot destroyed much of the prison before the Federal Bureau of Prisons terminated its contract to hold as many as 3,000 inmates in the minimum-security prison. The prison’s closure slashed a third of Willacy County’s $8.1 million general fund budget, forcing the layoffs of 400 employees, while sparking a financial crisis in this farming region where jobless rates are about 13 percent. The new facility is expected to create about 275 jobs, Willacy County Judge Aurelio Guerra said after entering into an agreement to sell the facility on March 7. As part of the deal, an agreement will pay the county $3 a day for every inmate held in the facility, Guerra said. The sale, which will put the previously tax-exempt property on the tax rolls, could potentially generate $1.5 million to $2 million in annual tax revenue for the county’s taxing entities, including the City of Raymondville and the school district, Guerra said. The sale price could help determine the property’s taxable value, said Agustin Lopez, chief appraiser for the Willacy County Appraisal District. But Guerra, who could not be reached yesterday, has said he was uncertain of the sale price. However, he has estimated the price ranged from $60 million to $68 million, citing the facility’s $6.9 million reserve fund and questions surrounding business interruption insurance payments. Meanwhile, MTC has declined to disclose the sale price. Lopez said he expects MTC’s building permits, which will disclose the cost of construction projects it plans, will help determine the facility’s taxable value. “We don’t know what they’re going to add, what they’re going to remove,” Lopez said. Based on an appraisal of $68 million, Guerra has said the county is expected to collect $350,000 to $450,000 in annual property tax revenue. Raymondville City Manager Eleazar Garcia said the property could generate tax revenues equal to about one-third of Raymondville’s current total valuation of $166 million — if it is appraised at $68 million. 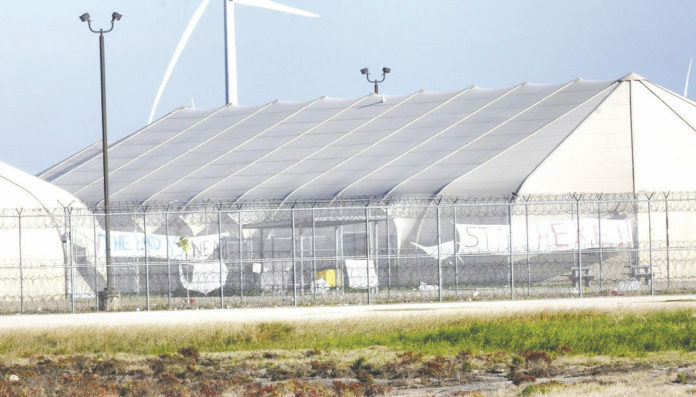 In 2006, the county sold $60 million in bonds to build a 2,000-bed detention center made up of 10 tent-like domes to hold undocumented immigrants for U.S. Immigration and Customs Enforcement. A year later, county commissioners sold $50 million in bonds to build a 1,000-bed concrete housing unit, expanding the detention center’s capacity to 3,000 beds. Under ICE, the detention center fell far short of projected income, with the agency filling about half of its 3,000 beds. In June 2011, ICE pulled out of the facility, leading to 120 employee layoffs. A month later, the county issued $76 million in bonds to refinance the facility as part of a plan to convert it into a minimum-security prison to hold undocumented immigrants convicted of crimes for the Federal Bureau of Prisons.